A limited number of public tickets are available for this free event. Ticket reservations must be made in advance by calling the Women’s Center at 502-852-8976. 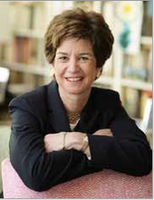 Kathleen Kennedy-Townsend "Women Taking Power Seriously"
Kathleen Kennedy-Townsend will be among the speakers at an upcoming University of Louisville conference, offering words of wisdom and encouragement to the next generation of women leaders: college students. UofL will host the College Women’s Leadership Conference at Ekstrom Library, Belknap Campus June 5-7. The conference is open to any college undergraduate and graduate student in Kentucky. Conference registration is $65. Kennedy-Townsend will speak on the topic “Women Taking Power Seriously” at 11:30 A.M. on June 7. Ms. Townsend served as Deputy Assistant Attorney General of the United States. Prior to serving at the Department of Justice, Ms. Townsend spent seven years as the founder and director of the Maryland Student Service Alliance where she led the fight to make Maryland the first and only state to make service a graduation requirement. She taught foreign policy at the University of Pennsylvania and the University of Maryland, Baltimore County. In themid-1980s, she founded the Robert F. Kennedy Human Rights Award. Ms. Townsend is Chair of the Institute of Human Virology founded by Dr. Robert Gallo, and serves on the board of directors of the John F Kennedy Library Foundation, the Robert Kennedy Memorial, The Center for American Progress, the Points of Light Foundation, the Robert Catholic Reporter and the Institute for Women’s Policy Research. Ms. Townsend is also a member of the Council of Foreign Relations and the Inter- American Dialogue. Previously, she served on the boards of the Export-Import Back, Johns Hopkins School of Advanced International Studies (SAIS), the Wilderness Society and was chairman of the board of the Robert F. Kennedy Memorial. An honors graduate of Harvard University, Ms. Townsend received her law degree from the University of New Mexico where she was a member of the law review. She has received then honorary degrees. A member of the bar in Maryland, Connecticut and Massachusetts, she is also a certified broker-dealer. Ms. Townsend’s book, Failing America’s Faithful: How Today’s Churches Mixed God with Politics and Lost Way published Warner Books in 2007. A limited number of public tickets are available for Kennedy-Townsend’s talk. Ticket reservations must be made in advance by calling 502-852-8976. UofL Women’s Center, Women4Women Student Board, and Office of Student Involvement are the organizers of the conference. Sponsors include Women 4 Women, UofL College of Business, UofL Vice Provost of Diversity and International Affairs Office, Vice President for Business Affairs Office, Commission on Diversity and Racial Equality, School of Nursing, School of Medicine, College of Education and Human Development, College of Arts and Sciences.